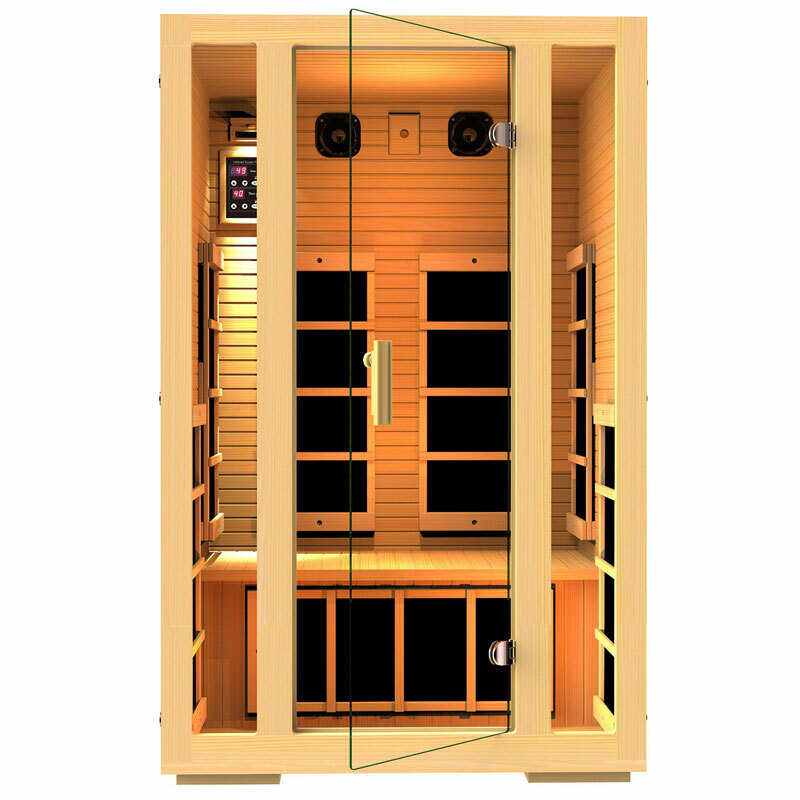 The JNH Lifestyles 2 Person Far Infrared Sauna is a sleek model with plenty of perks. 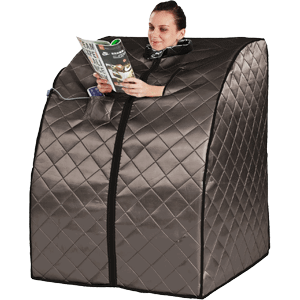 It’s available in both hemlock and cedar, and the hemlock model is the current best selling home sauna due to its quality and very reasonable price tag. Finding the right 2 person sauna for your home depends on what priorities are most important for you. In this article we discuss some important features to keep in mind when shopping for a home sauna, then we go over some of the best 2 person sauna models. Lets start with some aspects to consider before looking at different models. Firstly, most home saunas use infrared heat rather than a traditional heater, so your search may be a little more limited if you’re looking for the latter. 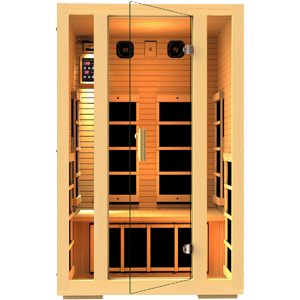 Infrared saunas have many benefits for home use, including a smaller footprint (space is not needed for a large heater) and a quick heat-up time. 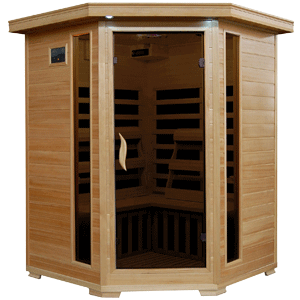 A traditional sauna needs to be either kept hot or given an hour or two to heat up for each use, but an infrared sauna is ready for use within 5 or 10 minutes. Also to be noted is the type of material used in the sauna. Many infrared home saunas are constructed out of hemlock or cedar wood, both of which are known for being great materials for saunas. Hemlock is strong, fairly light, and hypoallergenic, while cedar is a beautiful rich color and has a characteristic aroma many people love. Many top tier models do no chemical treating of the wood and use no plywood in the sauna construction, however some lower level models do have chemically treated wood and plywood included in their construction. The environmentally conscious may want to confirm that the sauna’s materials were responsibly sourced. Additional features are another aspect to look at. Are bells and whistles important for you? Some saunas have it all, from dual control panels with remotes to built-in lighting and built-in speakers with auxiliary cords. 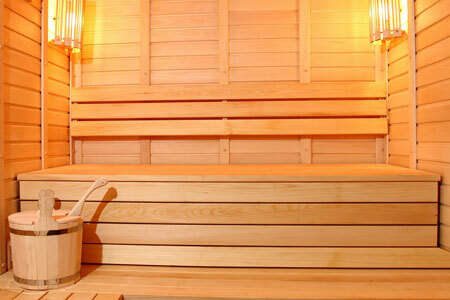 With these things in mind we’ve put together a list of the top 2 person saunas. View the summary below, then you can continue reading to get more details on a few of the most popular models. Hopefully the comparison chart above is useful in getting a quick sense of the variety of 2 person sauna models that are available at different price ranges. Below we’ll highlight a few of our favorites and go into more detail about what makes them intriguing. 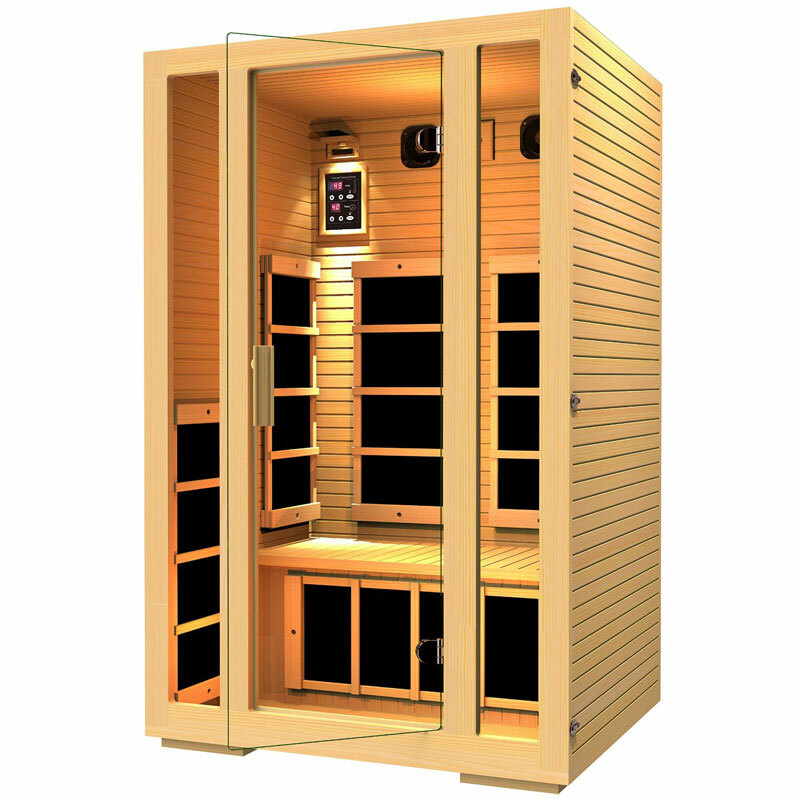 The JNH Lifestyles 2 Person Far Infrared Sauna is a sleek, elegant, and well-designed model. Its modern and clean look has style to spare. It is constructed entirely out of untreated Canadian Hemlock, and includes no chemically treated wood or plywood. This sauna is made of FSC Certified “Green” Wood, so environmentally conscious buyers can be assured that this sauna is made from responsibly sourced materials. Seven carbon fiber heaters function to get this sauna toasty. With these panels the sauna can reach temperatures up to 140 degrees in around twenty minutes. This model features a digital control panel that allows you to conveniently control the temperature and the duration of sauna sessions. Another bonus lies in the model’s built-in AUX control and 2 premium speakers. It’s also equipped with LED lighting. It is 47.3″ wide by 39.5″ deep by 75″ high. There is a 5 year warranty on all parts of the sauna including the speakers. The JHN Lifestyles NE4CHB1 is unique in that it is a sauna designed to fit into corners. It features 5 zero-EMF commercial grade carbon fiber far infrared heaters that are ETL tested and approved. 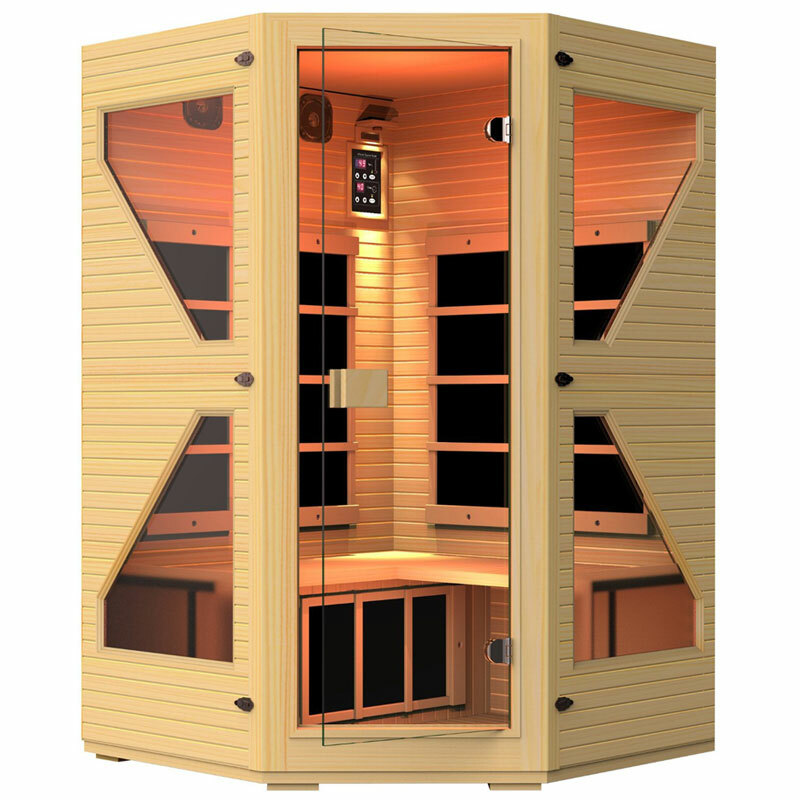 Like all JHN saunas, this model is made from FSC Certified “Green” Wood and the wood has received no chemical treatment. This model has tongue and groove construction and is made of Canadian Hemlock. Dual panel insulation means that this model has great efficiency, and also that you don’t need to worry about expansion issues. A digital control panel, built in speakers, and built in lights are other welcome components of this 2 person sauna. Its back wall measures 47.2″ wide, its side walls measure 27.5″ wide, and it is 75″ high. 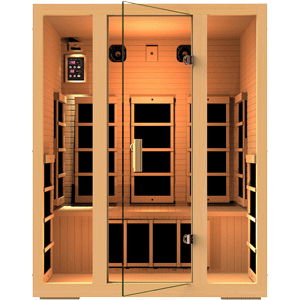 The Radiant Saunas 2-Person Hemlock Deluxe Infrared Sauna can reach a maximum of 141 degrees Fahrenheit. 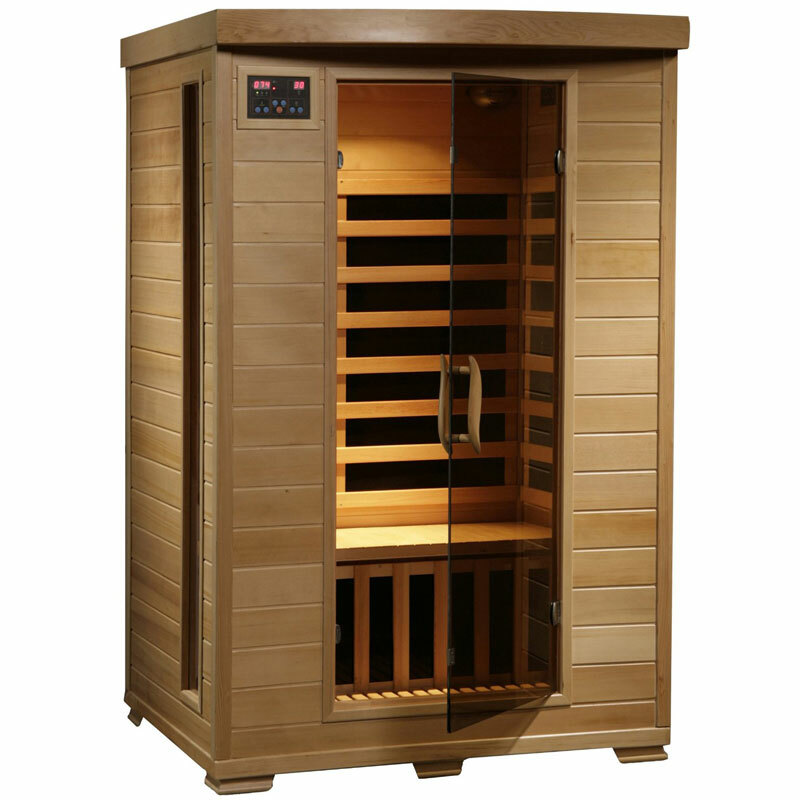 This model features interior and exterior LED control panels where you can set the desired temperature and duration for your time in the sauna. It includes a sound system with a radio, CD Player, and an AUX mp3 connection. There are also built-in speakers so you can conveniently listen to music via the AUX cord. It’s constructed out of solid Hemlock wood and has a tinted tempered glass door. Extra features of this model include a chromo therapy light, an exterior light, towel and magazine racks, air vents, and an oxygen ionizer. It also comes with 2 backrests. It measures 49″ wide by 39″ deep by 75″ high.